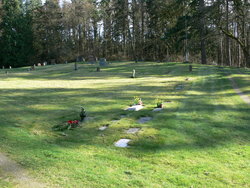 History: Pleasant Hill Cemetery is also called Brandstrom Cemetery. In addition, it was previously known as Baptist Cemetery and Pleasant Hill Baptist Cemetery. Directions: Located in the Victoria Heights area. From I-5, take exit 215 (300th St) east, then turn left (north) onto Brandstrom Road; follow Brandstrom Road for 1.5 miles to cemetery located on the (left) west side of Brandstrom Road between 319th NW and the creek.